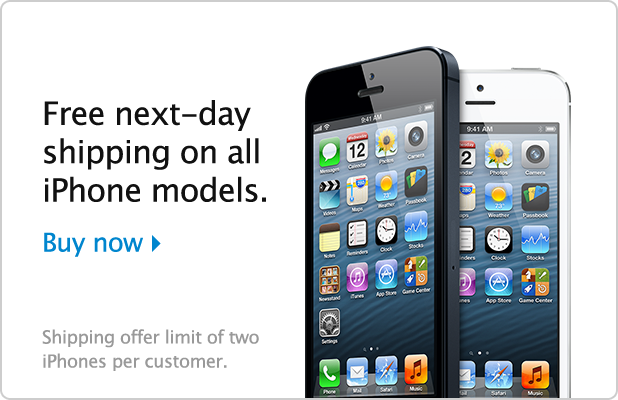 Apple has come up with a promotion where the company is offering free shipping which would be delivered the very next day, and this is applicable to all the orders that are exceeding the value of $50, and interestingly this offer is even for the Apple iPhone 4 which is being sold for for free with the contract. Apple has been working on the marketing and coming up with different campaigns especially after the rivals came up with their flagship devices, and the company had recently set up a page with the name “Why You’ll Love an iPhone” to attract more buyers, listing out the reasons why one would fall in love with the iPhone. The promotion is running right now, and the users can buy the iPhone right away and this Free Next Day shipping is limited to two devices per user account. As it isn’t associated with any particular holiday right now, this for sure is an offer that would make more buyers interested only against the newly coming heavy Android smartphones like the HTC One, Sony Xperia Z and the Samsung Galaxy S4. Apple has been always boasting about the J.D. Power Smartphone Satisfaction Rankings where the company claimed the win for the 9th consecutive time, and this is the ranking that is given based on the customer satisfaction. Apple is selling the iPhone 5 for the pricing of $199, with the 2-year contract, the Apple iPhone 4S for $99 with the contract, while the predecessor Apple iPhone 4 is being given for free when you take it with the 2-year contract, but as a part of promotion you are to pay nothing even for the phone to be in your hands on the very next day. Interesting enough, right? Apple would soon come up with the next iPhone version, as the iPhone 5 was the last model and it was launched in the mid-2012 so there should be an Apple iPhone 5S as the trend goes with the naming, but for those who look on saving upon other savings, this deal could be perfect, and as of now there is no time limit mentioned.